Just a note to let all know that all is well. I have noticed that in many of the blogs I visit lately, the artists have been sick. 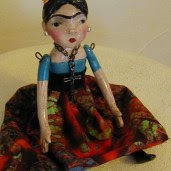 So I decided to post a doll that I made that reminds me that "Wild women don't get the blues." I've been tired lately. Almost to the point of exhaustion. I allow myself to sleep more than I used to and try not to let the house work get the better of me. I want a clean house but...I can't do it all. The economy is not so good and is expected to get worse. That does not help my sales. Almost everyone I know has some kind of hardship with jobs etc. That's probably because we're middle class. My daughter has decided to move out of the house and take the grandchildren with her. That, even though I believe it is a positive move for her, will cause me grieving again. Change is hard and change is slow. I will adjust. I sometimes think I feel too much. I think it is the blues that make me sick and I recently read that fibromyalgia does in fact stem from a chemical imbalance in the brain. Thus depression. So I need to stay as positive as I can during these trying times and try to control my thoughts. My thought for the day is "Wild women don't Get the Blues!" I'll let you know how this works for me.